This CellML model runs in COR and OpenCell to recreate the published results. The units have been checked and they are consistent. ABSTRACT: The ionic currents underlying autorhythmicity of the mammalian sinoatrial node and their wider contribution to each phase of the action potential have been investigated in this study using a new single cell mathematical model. The new model provides a review and update of existing formulations of sinoatrial node membrane currents, derived from a wide range of electrophysiological data available in the literature. Simulations of spontaneous activity suggest that the dominant mechanism underlying pacemaker depolarisation is the inward background Na+ current, ib,Na. In contrast to previous models, the decay of the delayed rectifying K+ current, iK, was insignificant during this phase. Despite the presence of a pseudo-outward background current throughout the pacemaker range of potentials (Na-K pump+leak currents), the hyperpolarisation-activated current i(f) was not essential to pacemaker activity. A closer inspection of the current-voltage characteristics of the model revealed that the "instantaneous" time-independent current was inward for holding potentials in the pacemaker range, which rapidly became outward within 2 ms due to the inactivation of the L-type Ca2+ current, iCa,L. This suggests that reports in the literature in which the net background current is outward throughout the pacemaker range of potentials may be exaggerated. The magnitudes of the action potential overshoot and the maximum diastolic potential were determined largely by the reversal potentials of iCa,L and iK respectively. The action potential was sustained by the incomplete deactivation of iCa,L and the Na-Ca exchanger, iNaCa. Despite the incorporation of "square-root" activation by [K]o of all K+ currents, the model was unable to correctly simulate the response to elevated [K]o. A schematic diagram of the Dokos et al. 1996 mathematical model of the SA node cell. 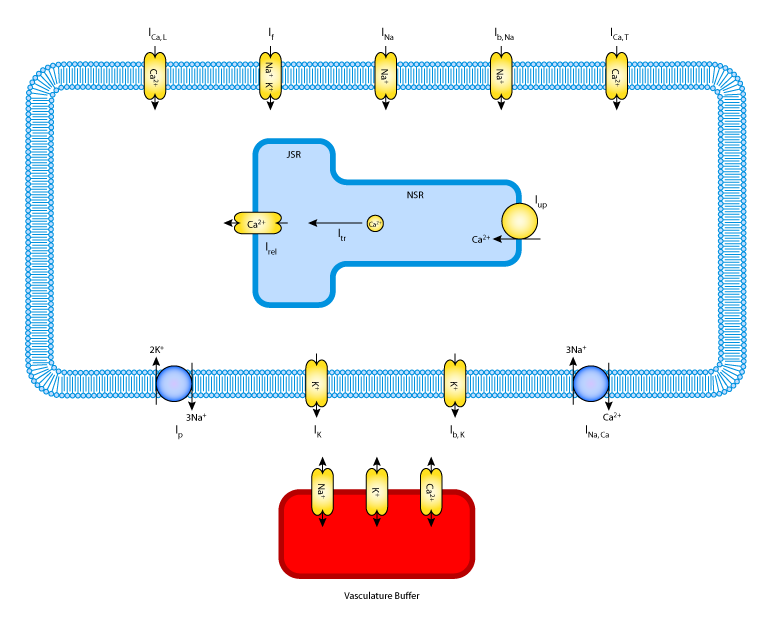 Sodium, calcium and potassium ions are exchanged between the intracellular and extracellular environments through channels, the sodium-potassium pump and the sodium-calcium exchanger. Calcium is transferred between the cytosol and the sarcoplasmic reticulum (SR), and between the local regions of the SR. Derived from workspace Dokos, Celler, Lovell, 1996 at changeset 58a19cab7f0b.